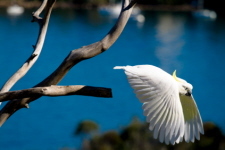 One of the most well known and often seen Australian birds is the Sulphur-crested Cockatoo. 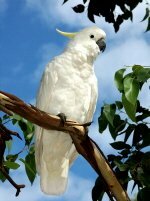 They are a noisy but beautiful White Cockatoo that measures around 48 centimetres in length, with a yellow crest and yellow on the underside of their wings and their tails. They feed on berries, seeds, nuts, roots and grain crops. When a flock are feeding on the ground, some of them will sit and keep watch, somewhere high, to warn if any danger is around, if they see anything they'll give a loud cry or screech as a warning to the rest of the flock. 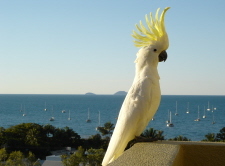 When we were kids my sister had a Sulphur-crested Cockatoo, she named him "Captain Flint". I was actually a little scared of him because he made a lot of noise (squawking) and he would put out his wings and run at me. It freaked me out but amused the hell out of the family. Captain Flint could talk too, he had a fairly large vocabulary, my sister taught him quite a few words and our father taught him to swear, which our mother didn't like but us kids found hilarious. Breeding time is normally from August to January in the south and from May to September in the north. Two to three eggs are laid which both parents incubate for about 30 days then both parents care for the young. Sulphur-crested Cockatoo family groups stay together. They are found in the north and in the east on the mainland of Australia, in Tasmania and in New Guinea.